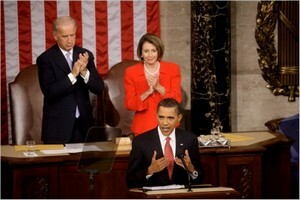 :: David Plouffe provides some perspective for the party of "NO!" on their choice of Rush Limbaugh-aka-the-sphereazoid-sleazy-manhood-cruncher-former?-druggie-I-hope-Obama-fails-right-wing-radio-show-lunatic, as their new leader. The 2008 election sent many messages. At the top: Americans wanted to turn the page on the politics of division and partisan pettiness, and they wanted a government -- and country -- that would put the middle class first. Watching the Republicans operate this past month, it would appear that they missed that unmistakable signal. Instead, Rush Limbaugh has become their leader. Limbaugh, of course, told his radio listeners that he's rooting for President Obama to fail -- and hoping the president's ideas for bolstering our economy fail with him. For many Americans, hungry for leadership and cooperation, this sounded like fingernails on a chalkboard. When Limbaugh reiterated the sentiment this weekend, hundreds of Republican conservatives cheered him on. But instead of rebuking the radio personality or charting their own course, Republican leaders in Washington are paralyzed with fear of crossing their leader. Less than 24 hours after committing the unforgivable sin of criticizing Limbaugh, RNC Chairman Michael Steele felt compelled to publicly apologize. He was not the first and will certainly not be the last. :: Steele, annoyed by CNN's D.L. Hughley, who referred to radio host Rush Limbaugh as "the de facto leader of the Republican party", says "NOT. I am the defacto leader of the Republican party." Steele goes on to say that Limbaugh is nothing more than an "entertainer" whose radio broadcast is "incendiary" and "ugly". As was predictable, Limbaugh responded like the puffed-up pig he is, on his radio show today. "So I am an entertainer and I have 20 million listeners because of my great song and dance routine," Limbaugh said. 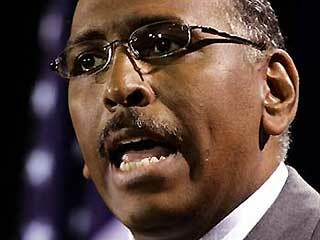 "Michael Steele, you are head of the Republican National Committee. You are not head of the Republican party. Tens of millions of conservatives and Republicans have nothing to do with the Republican National Committee...and when you call them asking for money, they hang up on you." "I hope that changes," Limbaugh continued. "It's time, Mr. Steele, for you to go behind the scenes and start doing the work that you were elected to do instead of being some talking-head media star." What a completely laughable entity the GOP has become. Robert Gibbs' comments on Limbaugh today. NEWSWEEK's Special Election Project is out, and the article will appear in the issue which hits the stands today. In regard to Palin, a senior McCain campaign official told Newsweek that Nicolle Wallace had directed Palin to purchase three suits for the convention, and to hire a stylist. Palin apparently took advantage of the situation, and spent much more money than was originally reported. Just another example of Palin doing what Palin does best.........stupid. Palin began buying for herself and her family—clothes and accessories from top stores such as Saks Fifth Avenue and Neiman Marcus. According to two knowledgeable sources, a vast majority of the clothes were bought by a wealthy donor, who was shocked when he got the bill. Palin also used low-level staffers to buy some of the clothes on their credit cards. The McCain campaign found out last week when the aides sought reimbursement. One aide estimated that she spent "tens of thousands" more than the reported $150,000, and that $20,000 to $40,000 went to buy clothes for her husband. Some articles of clothing have apparently been lost. An angry aide characterized the shopping spree as "Wasilla hillbillies looting Neiman Marcus from coast to coast," and said the truth will eventually come out when the Republican Party audits its books. Palin was also successful in so riling up her crowds that the reports from the Secret Service showed a sharp increase in threats to President-elect Obama in September and early October. Sarah Palin should in no way be encouraged to run for national office again, in my opinion. She is completely unqualified and unworthy.